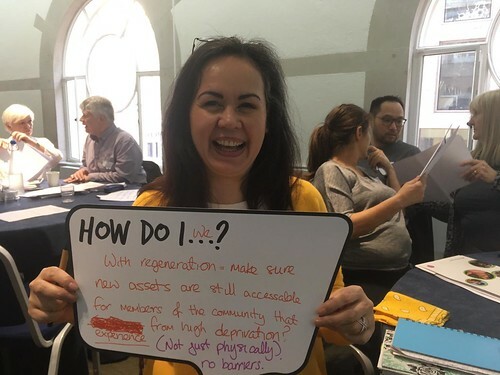 To prepare Local Trust’s response to the Calouste Gulbenkian Foundation’s (CGF’s) consultation on its Inquiry into the Civic Role of Arts Organisations we asked Big Local areas to illustrate how they’ve been engaging with creativity and the arts. We were struck by number of examples we received, the quality of the work (regardless of whether projects were large or small), the scale and ambition of some of the projects as well as the extent to which the arts and creativity are central to the plans of a few areas. CGF is interested in how arts organisations in receipt of public funding work with and for local communities. As such, we were interested in how Big Local areas are commissioning or otherwise working in partnership with such organisations. The CGF report on the first phase of the Inquiry, Rethinking Relationships, sets out for consultation the foundation’s plans for developing its work on the civic role of the arts, which includes a place based funding programme and capacity building for arts organisations. This partnership worked with People United to develop a large scale participatory arts project called The Best of Us. They used film, photography, dance, visual art, sound, song and urban art to explore the best characteristics and strengths of local people. It gathered stories of ‘bravery, citizenship, hope, zest and persistence’. Because of the project many local residents are engaging in or developing arts activities. These include an intergenerational singing group called Sing Your Heart Out and the Big History project where residents researched and recorded Newington histories. With the support of People United and working with an artist in residence Nova Marshall, a group of residents of all ages have become Creative Champions for the area. They create exhibitions, run events and programme an annual arts festival called Best Fest. This area has partnered with Birmingham City University's School of Film Studies on a three-year project. During the first year, a five minute film was produced, entitled Zombies are People Too. Residents made up the cast while Birmingham City university supplied the crew. Filming took place over two weekends, one weekend on the estate and one on the film school’s sound stage. Two spin-off short films are also planned: a spoof documentary about zombie life on the estate and a film about the making of the film. In the second year, the film school will run a monthly film making club on the estate. Residents will also learn how to make films with the technology they have available, such as phones and tablets. In the final year residents will make a longer film, taking on more of the crew roles. providing combined community and arts spaces. One arts organisation quoted in the report refers to working with a community as they would with a professional artist, supporting it to realise its vision. Some of the testimony we received from areas about the power of the arts and creativity to bring people together, to engage disengaged young people, to address loneliness and isolation, as well as simply being a source of fun and celebration underlines the value and importance of the Inquiry’s work.